Welcome to the Cindra In-Depth Guide. In this guide, you'll learn all you need to learn about this rising phoenix! Note that this guide is NOT a substitute for experience. It's always better to go out there and play some games! This article was written by long-time community member chucklyfun with some help from Marco and Aliphant! Thank you so much for the hard work and for contributing to the community! Cindra does best against opponents who rely on tricks to stall out the game while they whittle you down with light hits. Spread out over so many hits, they just can’t get in the damage to break through soak and make up for when they inevitably do get hit. This is especially true when their tricks don’t work on her. Against heavyweights, Cindra is balanced to trade evenly. These matchups tend to at least be even. Her problem tends to be against characters who can get in one really strong payoff attack without getting hit back. For example, Shekhtur’s Combination Drive will go through your soak and deal 8 damage with Force Gauge Power or a charge from the previous beat. You will die from life loss and are in danger from the beat after you transform. Vanaah, meanwhile, can deal a hefty 8 damage (-2 from soak) with Glorious Drive + Divine Rush token + Force Gauge Power. The usual counter to both of these is a Dodge, which is Cindra’s least favorite base in Phoenix Form. Even so, she has options to deal with them. Malandrax Mecchi is an advanced character who uses traps with different special abilities to protect himself and poke at enemies, whittling their health down. Unfortunately, his traps aren’t very useful against Phoenix Form as most of his damage will bounce off her soak while her incredible long range hit confirm will wreck him as he tries to run away. Sarafina Vanendran is a short range character with lots of control effects. She often fails against characters with more movement than she does and Cindra has a ton on Human Form. In Phoenix Form, those effects just don’t make up enough for their difference in power. Her most significant effect allows her to dodge attacks at range 1. It comes with a priority penalty and a power penalty that will prevent most of her attacks from even getting through soak. Meanwhile, Cindra’s favorite attack at that range, Luminary Drive / Grasp, has plenty of priority and knocks her away so the dodge effect doesn’t even activate. Sarafina’s Silver should be great against nullifying the effects of stat monsters, but it doesn’t work on printed stats, which are all that Cindra has. Locus gives Sarafina a great priority bonus, but Cindra is going second every beat anyway. Sarafina just doesn’t have the power or utility to go up against that much soak. Against Hepzibah, there isn’t much that Cindra can do. Hepzibah is known as the heavyweight killer, having an Ignore Stun Guard available every single beat as well as a ton of power. The usual counter to Hepzibah is Dodge, which is as I said before, Cindra’s least favorite base. Meanwhile, Hepzibah is fine dodging Cindra. Cindra does have Smoldering with Dodge attacks at range 2-3 and Ignore Soak and Stun Guard, but that isn’t really enough. Baenvier Marlgrove has Spellbreaker Tokens that put both player’s styles back in hand on ante. He also has a Spellforge style that puts an opponent’s style back in hand On Hit. This all makes Baenvier extremely strong against stat monsters who are overly reliant to their styles. Even worse for Cindra is that her payoff beats are all at the end of her game, so Baenvier knows exactly when to use his Spellbreaker Tokens. Cindra does still get her soak (and her life loss), so she’ll want to be in close range in order to maximize the use of her bases if Baenvier uses a Spellbreaker token, which is not where she wants to be to use her styles effectively. Cindra Flama is switches from an evasive, middle ranged fighter in her human form to a real powerhouse of a heavyweight after she goes through her transformation into phoenix form. Because of the extreme power on her phoenix form, It’s easy to consider that the focus of her power. Unfortunately, it goes very quickly because of the life loss effect and doesn’t give you the time to optimize your strategy. Make use of Wings as much as possible. It's the strongest UB in the game if you can land it. Using Soaring for confirm if you're afraid they'll duck into your min range. Delay the transformation as long as possible. Stay at long range to avoid trading blows - null beats are good. Ashen Burst and Ashen Wings help you hit at long range and prolong the fight while staying safe yourself. If you transform, try to kill your opponent as quickly as possible, especially with high power styles. Stay in the corner or bait out dodge to leave them with no response to a high power Strike or Shot that has long range and enough damage to kill them. Cindra has no clear weaknesses, and is versatile. She's able to operate at all ranges and is not especially vulnerable to certain effects (as compared to eg. heavyweights being especially vulberable to Ignore Stun Guard). Cindra is able to "kite" down enemies at long range. She is a strong defensive character with several sources of soak, healing and evasion. Cindra can often set up unstoppable kill pairs in Phoenix form. Cindra is very vulnerable to a bad read or positioning losing the game for her in Phoenix form. Taking too much damage early on can sometimes result in an "auto loss", with Cindra finding it very difficult to comeback from moderate to large life gaps due to her UA acting as a timer. Cindra's finishers aren't that good. Versatile slot with no clear weaknesses. Cindra cannot act as ban bait, but is not susceptible to throwing a match at character select. She does well against heavyweights, so you can use her as an anti-heavyweight that is also a safe option for matches that don't involve them. Overall a safe, versatile and balanced pick. You can sleep easy at night with her on your team. 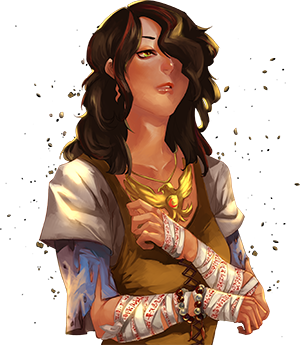 Cindra has relatively average stats in human form for priority and power along with with ranges of a middle ranged fighter. The interesting parts are all in the text, as she has movement effects galore. Phoenix Form Cindra takes a huge priority hit but makes up for it in power that rivals most characters' finishers. 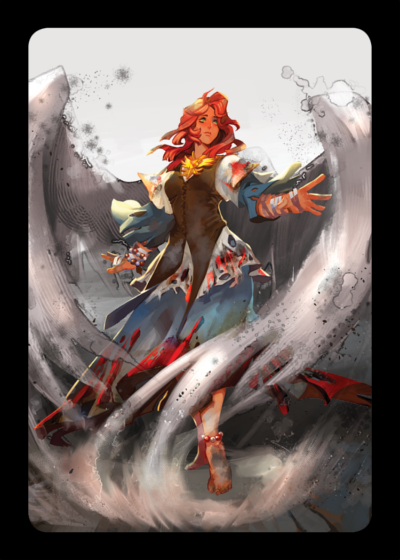 Ironically, she has less stun guard and soak on her styles so she relies on her bases and Phoenix Form to make up for it. Whereas in Human Form, Cindra was running away and picking her trades, Phoenix Form Cindra wants to force a fight because of her life loss time limit. Cinder functions as your default way to use Shot or Wings because of its soak and stun guard matched with no hit confirm at all. Notably, it does have an After Activating Retreat effect. With the styles -1 priority, though, this is probably more about setting up for the next beat rather than avoiding damage. Oddly enough, this also has an life loss effect on an End of Beat trigger. This gives her a little more of an edge against opponents who are really good at sticking to their targets. Kindled serves as Cindra's huge power style in Phoenix form. While she can deal major damage with just about anything she has in this form, Kindled has the privilege of also reducing the opponent's power, possibly saving her from a really bad trade, especially when considering that her UA's life loss can kill her. When paired with Wings or Drive, this style can truly set the world ablaze. Rising is one of the easiest styles to figure out. Use it with Strike or Grasp to give them the hit confirm they need. Of course, Cindra usually wants to be far away and this is moving her closer. Still, this can be used to cross over and open up more retreat options. It also gives you options against even more dedicated rangers. Keep in mind that you have to move 2 spaces or the movement effect won’t trigger. This isn’t the “Before Activating: Move 1 or 2 spaces” trigger on Drive. Ember, like her Phoenix style in Human Form, is her most versatile style. With +0-2 range, +2 power, and only -1 priority, which is actually good for her Phoenix form, she can match this with almost any base, depending on the opponent. 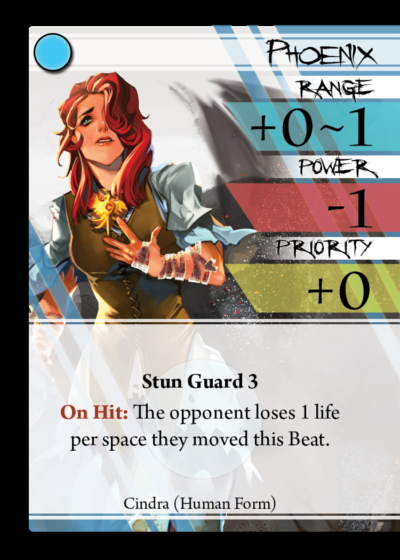 The On Hit effect can be used to avoid retaliation from slow opponents or set up for the next beat. Ashen is Cindra’s payoff style in human form with her only source of +1 power. While it has a very narrow range of +2, played with Strike or Grasp for a total range of 3, it has movement effects that give you hit confirm from range 2-4. This is a slow style at -2 priority, but it does have an optional “Start of Beat: Retreat up to 1 space.” to make up for it. Also, the “Attacks at Range 3 or greater do not hit you.” gives you a neat dodge effect which is especially nice since Cindra is very comfortable with null beats. Smoldering might be Cindra’s most reliable Phoenix Form style with a range of +0-4. That’s just short of full board range with a range 1 base. While Cindra has great hit confirm in both forms, evading and moving out of range was still many opponent’s best option when dealing with Phoenix Form, next to maybe Dodge. The rest of this style is an odd set of abilities, with Ignore Stun Guard on an extremely low priority style of -3 and a dodge effect for opponents at range 2-3. I’ll cover the latter later on in advanced strategies. Putting Ignore Stun Guard on a -3 priority style allows them to balance her against heavyweights without crushing other characters. Against them, the dodge effect provides similar utility and is easier to play around. The default bases here should be Grasp against heavyweights to interrupt a payout attack, Strike against everyone else, and maybe Wings if you’re having trouble using it on Kindled or Ember. Luminary is her only style with positive priority and pairs well with Grasp, Drive and Strike. It has the lowest printed power, but makes up for it with a Before Activating effect at range 1 that pushes opponents away and deals life loss. Notably, from the center space, this hits the whole board. With Drive, she can activate the range 1 bonus life loss anywhere. While Phoenix Form Cindra is still a focused on the mid-range battle, she can do just as well up close and has options on both the inside and outside of the center. Phoenix is a great mix-up with Ashen. So the opponent wants to move in so they can actually hit? Each space they move now earns them a point of life loss. Play with Shot to be safe at minimum range and Wings for Soak and Life Gain. Stun Guard 3 makes either one a good pair, while neutral priority of 0 and range of +0-1 makes this a great toolkit style that can be played with any other base as well. Perilous is a Dodge Punish where opponents moving past you take 2 life loss. Like Ashen, this has a fixed range of +2 but comes with mobility effects making for actual hit confirm of 2-4 when paired with Strike. Shot works here too if you need even more hit confirm and full board range. 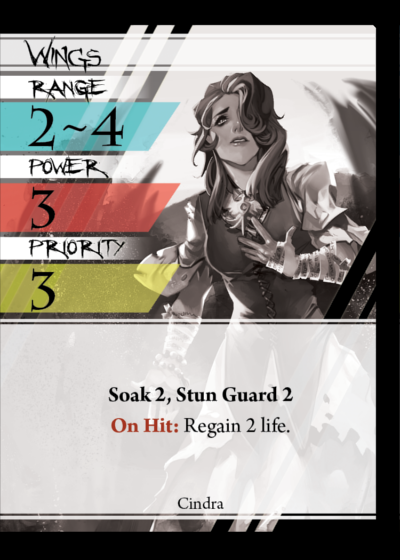 The real story with Perilous though is a an incredibly powerful +4 damage matched with -3 priority, making it her most extreme style on both power and priority. Wings is her unique base and is available in both Human and Phoenix form. With Soak 2, Stun Guard 2, priority 3, range 2-4, and “On Hit: Regain 2 life.“, this is a candidate for one of the best unique bases for trading in the whole game. Of course, watch out for your Ignore Soak / Ignore Stun Guard, dodge effects, and so on. 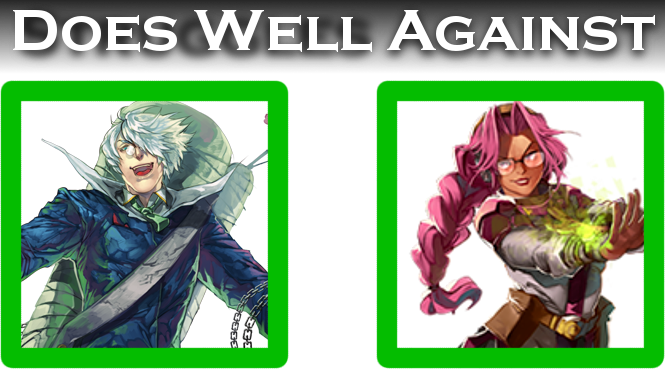 With that much soak and stun guard, you probably don’t need to care what you pair it with, though her options there are all pretty good, focusing on Cinder, Phoenix, and Soaring if nothing else. Cindra needs to use the occasional Force Gauge Stun Guard in Phoenix Form to make her bases without stun guard safer. Meanwhile, use Force Gauge Power in Phoenix Form in order to put more of her attacks into damage range to close out the game. Use Force Gauge Priority sparingly, as it is usually better to save up for the finisher or another stat boost. Cinder Storm is very good for helping Cindra finish-off an opponent. Given her low speed, the On hit effect gives Cindra a good chance of out-speeding the typical opponent. As an added bonus, the opponent also gets reduced power. This, in conjunction with Cinra's natural Soak in Phoenix form, make it really hard to get out of her attack. Just watch out for Dodges! Blazing Pyre, on the other hand, is less about killing opponents and more about saving yourself. Cindra's UA life loss can be a big problem, especially because it can kill her. This finisher gives Cindra some extra time, just in case the opponent decides to be cute and Dodge almost every rotation.